I’ve recently received the question about a how to resize the virtual disk of a virtual machine. In this previous post, we already talked about this topic. At that time, we discussed on how to resize disks when the vm files were located on local storage. 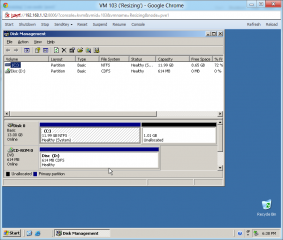 In this post, we will see how you can resize virtual disks of your virtual machines if the VM files are located on a LVM group. Based on the proxmox ve wiki pages about storage model used by Proxmox VE, we know that the preferred storage model is to use LVM Groups. 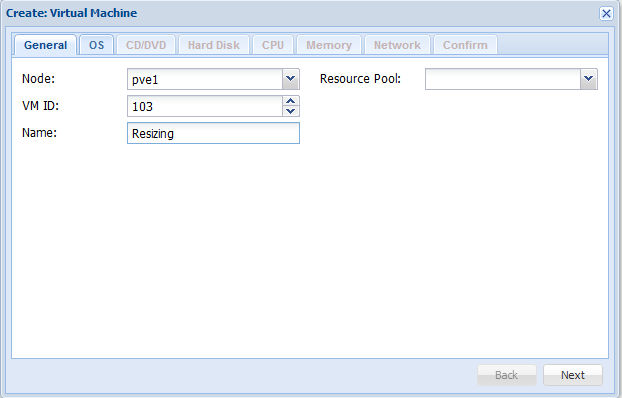 When working with LVM Groups, you can use 2 different configuration. You can use local storage to create your LVM Groups (aka LVM groups with Local backing). If you have an iscsi infrastructure, you can use the network storage infrastructure to build up your LVM groups as well. This configuration is often called LVM Group with Network backing. 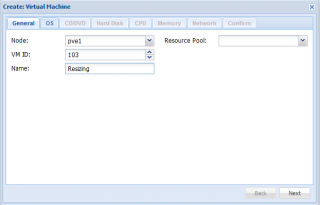 In this post, we will quickly demonstrate how to create these LVM Groups with network backing. Based on this configuration in our Proxmox VE infrastructure, we should be able to demonstrate how to achieve in an elegant way the resizing of a virtual disk. Let’s start…. We assume that you have already an up and running iscsi infrastructure ready to be used by the Proxmox VE infrastructure. We assume that a iscsi target is already available and that we just need to connect to it from our Proxmox VE infrastructure. When you are ready with your iscsi infrastructure, you can open the Proxmox VE web interface and click on the Datacenter node in the Tree. In the right pane, you will see the Storage Tab. In this page, you will see the “Add” button at top left. Click on it and you will see a dropdown menu. From the menu, select the ISCSI target. You will need to enter the required information. Press Add when you are ready. Within the Web Interface, you should see an additional storage item displayed. Again, from the storage tab, you will click on Add. From the drop down menu, you will select the option LVM Group. The following input box will be displayed. Again, you will have to provide the correct information. In the ID field, provide a name that can help you identify this LVM Group. After selecting the base storage, you will see 2 additionial fields displayed in the dialog box. ensure that you’ve ticked both checkboxes in this wizard. 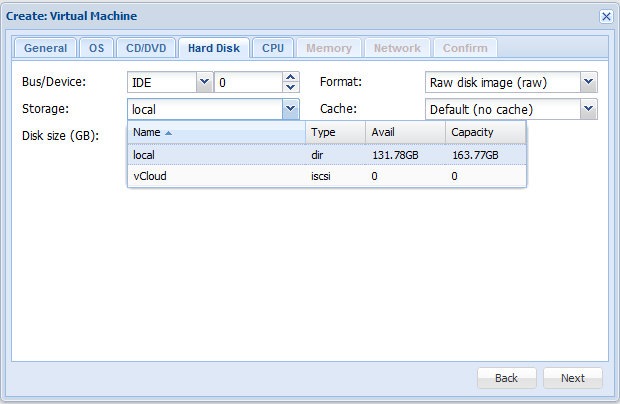 At the end of the process, within the web interface, you should see that the LVM storage object has been created. Here, we will simply create a virtual machine that will be located on the LVM Group we have just created in the previous step. We will create a virtual machine with a small disk. In the following steps, we will increase the size of the disk. To create your virtual machine, from within the Web server, you click on the Create VM button in the top right corner of the interface. The Create VM Wizard will start. That’s the part that you are probably interested in. As you will see the process is quite simple. Most of the operation are to be performed from the command line. So, connect to your proxmox console. 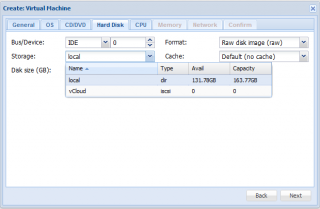 As a best practice, ensure that the virtual machine is turned Off before resizing the disk. At the bottom of the screenshot, you will see that we have issued the command above and the console return a successfull operation. 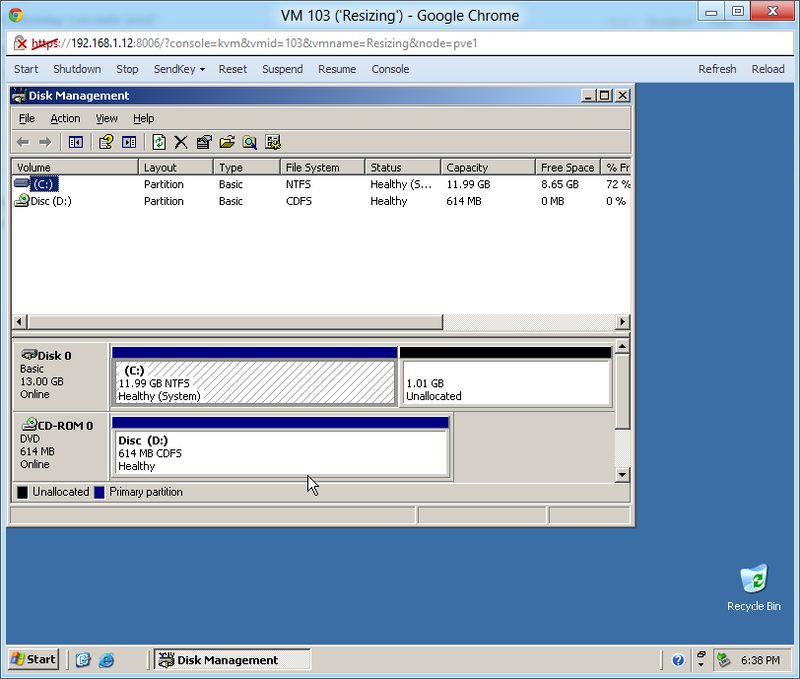 Step 5 – restart the virtual machine. Step 6 – resize the disk size within the Operating system. If you open the disk management, you will see that the size of the hard disk has been increased. And Voila ! That’s as simple as that. Proxmox VE and LVM technology provide enough flexibility in order for you to resize in an easy way to resize virtual machines hard disks. As far as I know, this is the easiest (fastest way) to resize disk files located on a LVM group storage. Other options/ways exists (such as the dd command) but these methods might not be as effective as the lvresize command. What if the the storage is NFS share. I have iomega storcenter ix4-200d. I have created an NFS storage there. The qcow2 disk for my windows 2008R2 server is residing on the iomega NFS storage. It is working great. If I want to increase the size of my disk, how do I do it. Interesting points: logical volumes for virtual machines have LV Status: NOT available in output from lvdisplay. This prevents you from access. Thank you for this post it is very useful. However when I extend the lvm for a linux vm I do not see that the drive extends within linux. Can you pleae advise? If I understand your question, you are asking how to increase the size of the disk inside the virtual machine, correct ? To extend the size of your disk, you can probably use the GParted Tool.